You can complete God’s Little Explorers Preschool Curriculum with just a few resources (school and craft supplies and a children’s Bible), but these are a few other resources I have found to be quite helpful! Read And Learn Bible – I found this Bible when my oldest daughter was beginning to read on about a 2nd grade level, and I love it! It doesn’t “add” any extras to the stories, and it stays accurate to the Biblical account. 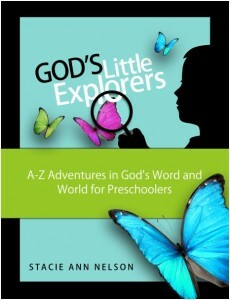 It is a nice read-aloud Bible, but your child can also use it for themselves when they learn to read. Wee Sing Bible Songs CD and Book Edition – This CD has many of the songs I remember singing as a child, and it includes quite a few songs we’ll be using through the year. What’s in the Bible DVD Set – I’ve been quite impressed with this approach to teaching children (and parents) about the Bible. This series comes from the creator of VeggieTales. Uncovering the Logic of English: A Common-Sense Approach to Reading, Spelling, and Literacy – I think this is an amazing book–with a message that is sorely needed in today’s educational climate. The Big Picture Story Bible (Book with CD) – I’ve loosely based the Bible stories for the year on this story Bible. The purpose of this Bible is to give children an overview of how the Scriptures all fit together. Usborne’s Wipe-Off Ready for Writing: I prefer to get little fingers ready for writing with tons of hands-on fine-motor activities, but this book is excellent for preparing your child to write (practice tracing circles, squares, making lines, and tracing letters). The Reading Lesson: Teach Your Child to Read in 20 Easy Lessons – If your child is showing signs of reading readiness, this is an easy and inexpensive way to get started. You can see my review of it here. Scribble Art: Independent Creative Art Experiences for Children (Bright Ideas for Learning) – We will be doing crafts and various kinds of projects, but this book is excellent for art experiences. I just recently got this, so I am using this for all three of my girls one afternoon per week for a basic art curriculum. Anholt’s Artists Series – These are excellent picture books to use when teaching about artists. We pick out one artist per month and learn about him (or her). Sharing one of these stories and looking at various works from the artist is a gentle introduction for preschoolers. Christmas Carols for Kid’s Heart (Hymns for a Kid’s Heart, Vol. 3) – Beautiful CD and stories to use during Christmas. Passion Hymns for a Kid’s Heart (Hymns for a Kid’s Heart, Vol. 4) – Excellent CD and devotions to use during Easter. Hymns for a Kid’s Heart – A free site based on the books above (plus two others that seem to be out-of-print). It offers free MP3 downloads for the hymns and free sheet music. Hymn study: Each week, the girls and I learn a hymn during our Bible time. We practice it every morning. While they may not have all the words by the end of the week, they have generally picked up the tune and a few of the words. We will repeat the hymns each year, so they should eventually know them! Composer study: The main way we study composers is to listen to a LibriVox story about one of them per month, find and listen to music by the composer throughout the month, and find and print a coloring page. Artist study: We pick one artist to study per month. I have purchased the Anholt’s Artist series above, so we read the book first. Then, I find various works from the artist and we look at them. I will also have the girls do an art project in the style of the artist (you can view our Masterpiece Monday series here).